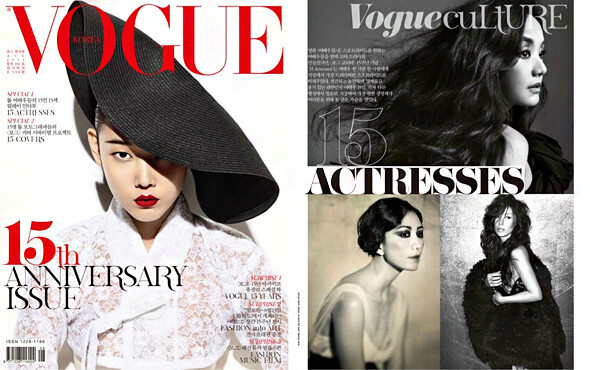 Here's the second part to Vogue Korea's 15 Actresses editorial for their August 2011 issue. If you missed part one, check it out here. Photographed by Kang Hye Won, actress Uhm Ji Won (엄지원) wore outfits from Christian Dior, Donna Karan, Jamie & Bell, Minetani and Tasaki in the black and white photographs. Don't you just love Kim Yeo Jin (김여진)'s recent work in 'Can You Hear My Heart (내 마음이 들리니)'? Photographed by Kim Boha, she wore garments from Jain Song, Johnny Hates Jazz, Lebeige, Mucha and more. The lovely Shin Se Kyung was photographed by Kim Young Jun in garments from Agent Provocateur, Emporio Armani, Hexa by Kuho, Jimmy Choo, Lie Sang Bong, Repetto, The Centaur and more. 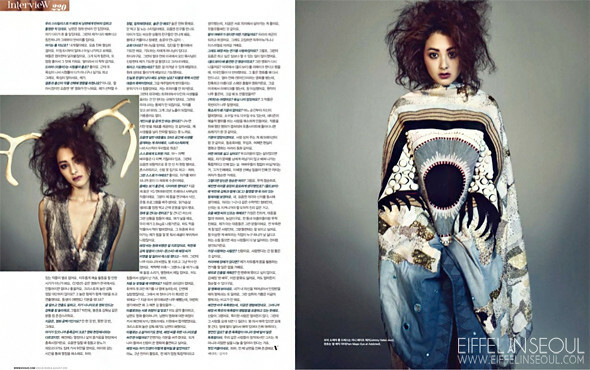 She was also featured in Eiffel In Seoul's August 2011 Calendar. I won't lie, Kang Hye Jung (강혜정) looks creepy in the editorial. She was photographed by Hong Jang Hyun in garments from Johnny Hates Jazz, Kris Ruhs, Michael Kors, Pam Magic Eye and Rick Owens. Ye Ji Won (예지원) was photographed by Jo Seon Hui in Chloé, Lie Sang Bong and Vov.